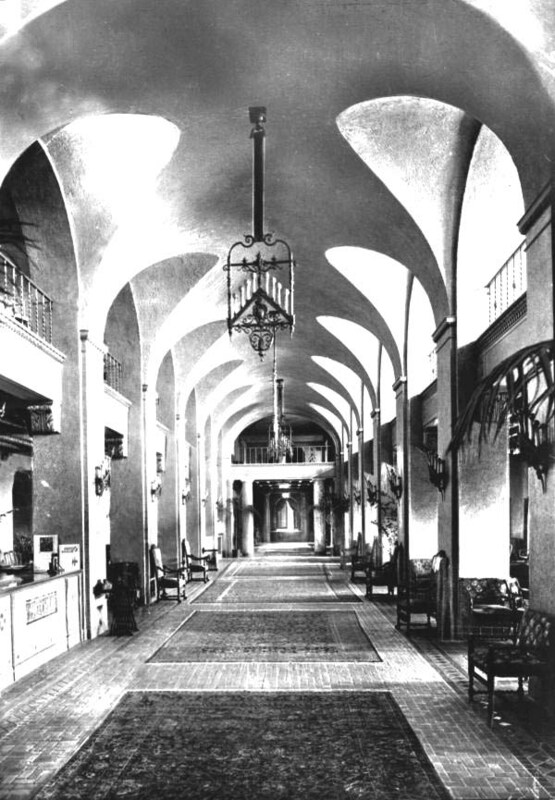 The Vinoy Hotel lobby, as it appeared during the 1920s. 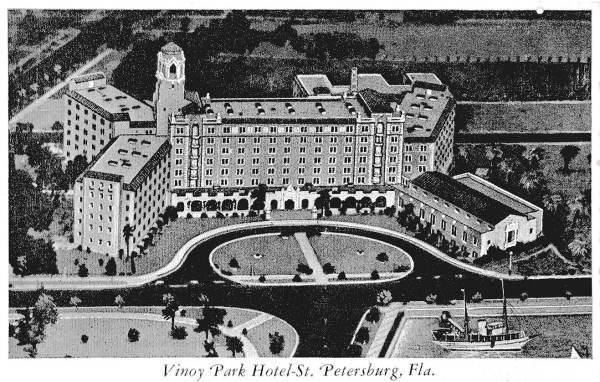 St. Petersburg’s Vinoy from the air, 1920s. 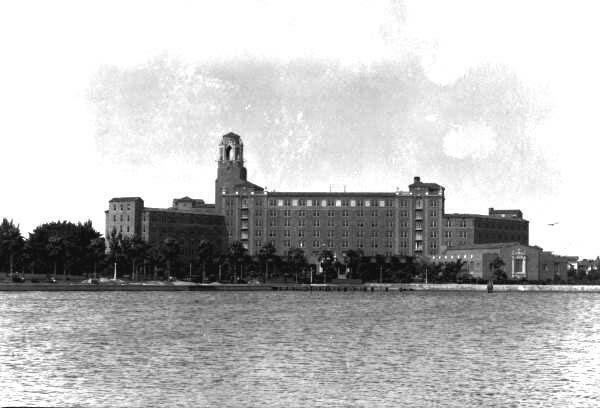 The Hotel in 1926, overlooking Tampa Bay. 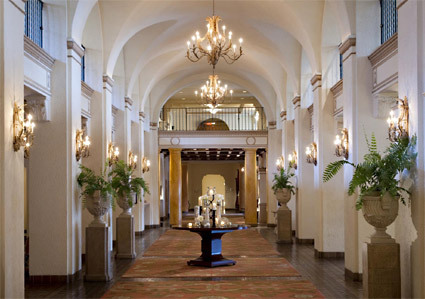 View from the balcony above the front entrance. 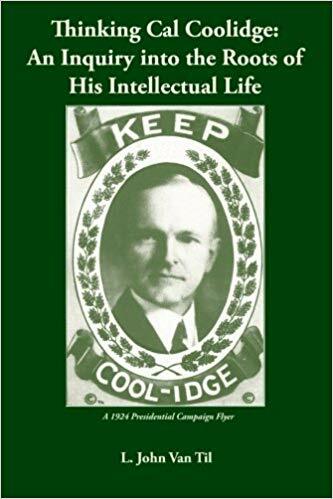 “In harmony with the other phases of his character, Coolidge had simple tastes. 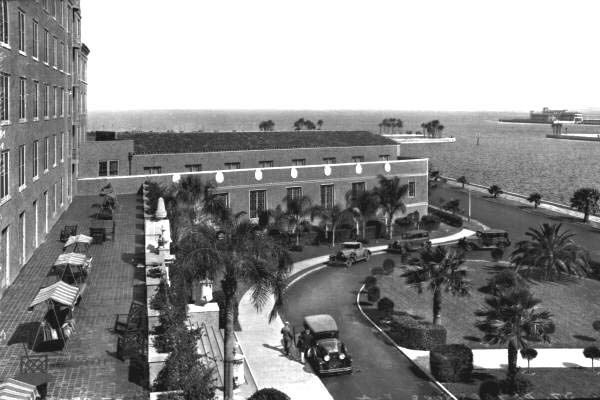 The living conditions under which he had been brought up were good enough for him, and he was in no danger of being corrupted by self-indulgence…Coolidge had himself no affectations and despised people who, as he said, ‘put on airs’…He had been taught as a child the evil of waste, and the lesson persisted. 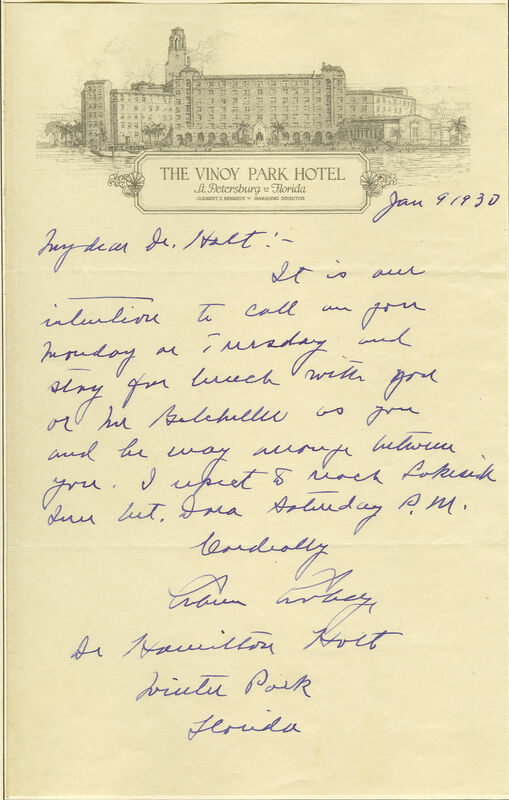 In July 1925, he went to Camp Devens to review the 26th Division, and thorough preparations were made for his reception. In his washroom General Logan had placed two immaculate towels for the President’s personal use; but just before he arrived a hot and dusty aide dashed into headquarters, visited the lavatory, and naturally dried his hands with one of the special towels. 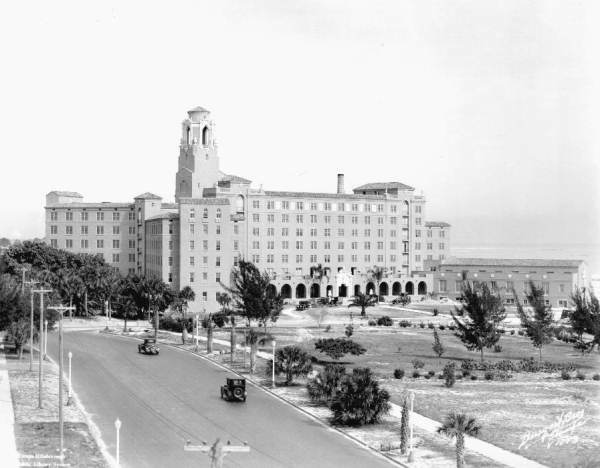 When the President was escorted to the washroom, his companion noticed that one of the towels was streaked with dirt, and proffered him the remaining one, but Coolidge waved him aside, saying, ‘Why soil it? There’s one that’s been used. That’s clean enough’ ” (pp.485, 487). 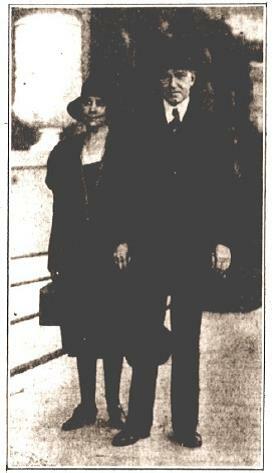 The Coolidges arrive in St. Petersburg, January 8, 1930, photographed for the St Pete Times, January 9, 1930. 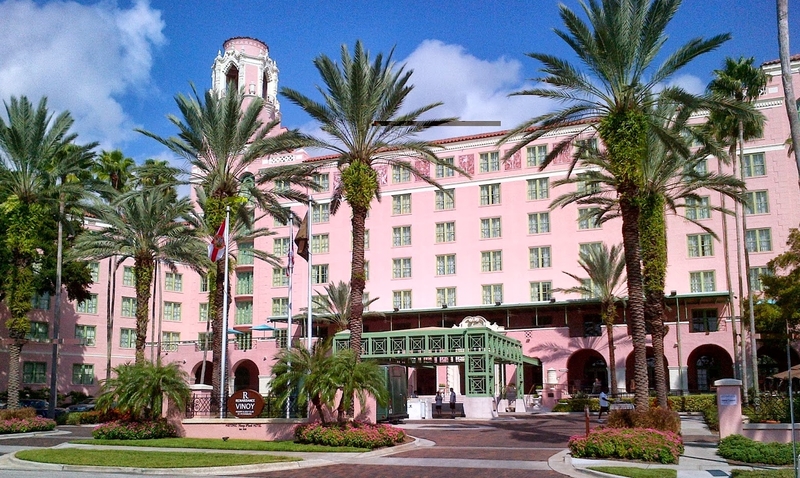 Coolidge addressed the 200 delegates convened at the Vinoy Hotel on the “Economics of Life Insurance,” January 9, carried at 9:30PM on WJZ out of New York and WBZ out of Boston. 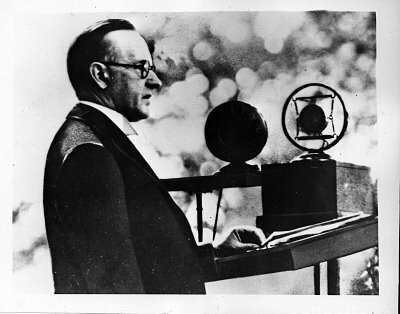 It was the first time Coolidge would speak publicly after the Presidency.